Actual sticky notes made of paper are so last century. The time of the Post-It are long gone and the new digital sticky note is its replacement. No sticky residue, no wasted paper and no screens surrounded by multicolored squares to distract you from your work. Long live the sticky note! 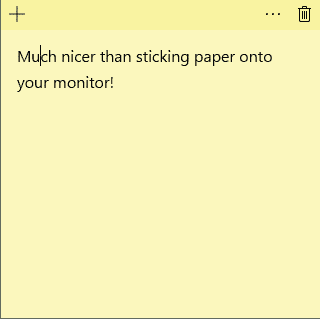 Windows 10 includes a version of digital sticky notes in the operating system as it knows how forgetful the average user is. Those of us who need reminding constantly of appointments, meetings or chores can benefit greatly from their inclusion. So here is how to use sticky notes in Windows 10. Rather than covering your sleek black monitor in cheap fluorescent colors, it might be easier on the eye to create them within the screen instead of on it. Type ‘sticky’ into the Search Windows (Cortana) box and a yellow square should magically appear on screen. Type into it to create your reminder. Click the three little dots to change the color and then the little cog in the bottom left to switch off sending usage statistics. Click the trash icon when you’re finished with the note. That’s all there is to using sticky notes really. Each note is held in memory and is dynamic in that you can change or delete them on the fly. They will also make it through a reboot so you don’t have to worry about losing them either. If you use Windows Ink, sticky notes take on a life of their own. If you write a date or time in the note, Windows will recognize it and can add it to your calendar. That isn’t available on the standard edition yet but we expect it to arrive soon. I like Windows 10 sticky notes. Such a simple idea yet helps busy people like me so much! 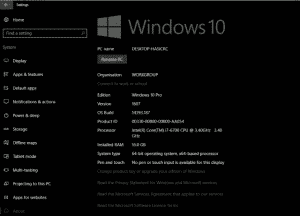 If you cannot access Windows 10 sticky notes or something is going wrong with them or anything on your computer, contact Dave’s Computers today. We’re here to help!